The Victoria and Albert Museum London has a couple of rooms which I think are now unique due to the fact that other museums around the world who also displayed similar objects have since disappeared. These are the casts rooms. The cast rooms are two large rooms which never fail to amaze and delight visitors. Even as a child I remember walking into these rooms and standing in awe at the sight of these giant monuments and amazing sculptures all gathered together in close proximity to each other. This feeling has not changed and it is still one of my favourite galleries within the museum. 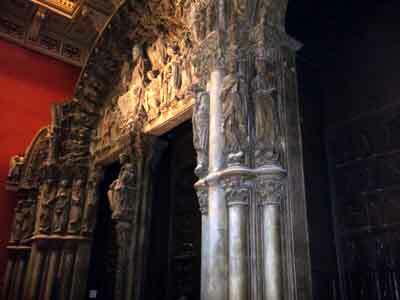 This video will give you a feel for the scale of the casts on display and the atmosphere within the rooms. It really has a very unique feel within the Victoria and Albert Museum London and is a must visit on anyone's itinerary. Taking plaster casts of ancient monuments was very popular during the 1900's and this is why the V and A has such an impressive collection. They mainly come from Europe and were made by some of the best craftsmen of the period. The idea behind these casts was to allow people to see great works of art from faraway places where they were not able to visit themselves. Remember in those days only the rich were able to travel widely. I think that even in today's world of international travel, how many of us can say that we have travelled very far or widely ourselves? So being able to see these amazing examples of fine art is still of great value. There are two cast rooms, one of which display works from Northern Europe and the other from Italy. One of the rooms is dominated by two huge columns; these are casts of Trajan's Column which was erected in Rome in AD113. The original column was 38 meter high and was made from Marble. All the way up the column there are rich carvings which depict all the battles which were fought by Trajan during his reign. 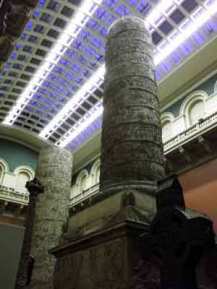 The cast of the column is displayed in two parts due to its height. However this does allow for closer inspection of the intricate carvings on them. 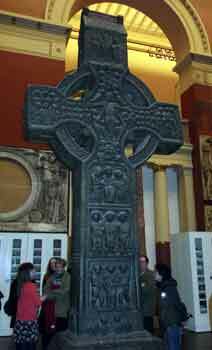 Cross (plaster cast 1903), Early 10th century from Ireland. Various scenes are carved on the cross including scenes from the Old and New Testaments and Signs of the Zodiac amongst others. I love celtic crosses and this one is stunning. It is painted black to closely replicate how the original cross would appear. This looks so real and I can only assume that the casts were taken in very small pieces and then the pieces were fitted together, although I can't see the join!